Here is a highly unusual detective in a highly unusual thriller. Jim Chee is a Navajo Indian and a sergeant in the Tribal Police. His inquiries into a minor theft at the home of the immensely wealthy uranium magnate, B. J. Vines ("Vines has got more money than Saudi Arabia"), lead back to a thirty-year-old mystery, an oil rig explosion which blew to pieces everyone on the site. The present sheriff still believes that it wasn't an accident, for a foreman on the site, an Indian named Charley, had warned his Navajo crew to stay away that day. He claimed to have had a warning vision, which just might be true as he was a peyote chief who used drugs to induce visions. 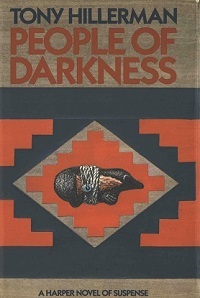 Sergeant Chee wants to question some of those Navajo survivors, but he finds that all of them are dead, including Charley. And that they all died of cancer, which is statistically extraordinary. Furthermore, Charley's son, who succeeded as peyote chief, has just died, also of cancer--and his body has been stolen from the university’s cancer research center. The case takes Jim Chee on to Charley's grandson--and to a ruthless contract killer, Wolf, a formidable character who plans his murders as carefully and as skillfully as he prepares his oeuvres en gelee. The tension mounts as the action accelerates, and there's a tremendous climax in which Chee, already nicked by one of Wolf's bullets, out-maneuvers the killer in the desert. And there's a very surprising denouement.